The young journalist overheard Wells-Fargo detective Harry Morse request that the news of someone’s sentence be “suppressed for a day, as he had promised” so Morse could give the “scoop” to a reporter friend on the San Francisco Morning Call. Sensing his own scoop Ward took advantage of a “brief interval” when the jailers shift changed and he “slipped through the gate to the secret cells.” In one of the cells, he located a man in a salt and pepper suit. The door to the cell was open and the inmate was sitting on the bed. Ward didn’t know who the man was and “threw his cards on the table.” He told him he was a cub reporter looking for a break. The inmate introduced himself as Charles E. Bolton, Black Bart, the notorious stage robber. The news of Black Bart’s arrest had made the papers a few days earlier but beyond that little was known about the mysterious stage robber. He was taken to San Andreas, Calaveras County, pled guilty and was sentenced. The story broke in rural Stockton, California eventually making its way to the giant and influential San Francisco papers that had lost out on the scoop. Bart’s appearance at the San Francisco jail was a stop-over on his way to San Quentin. 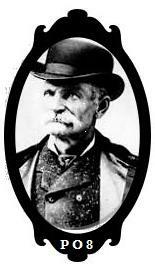 In his book, Black Bart, Boulevardier Bandit, George Hoeper relates: “This was a period of extremely bitter competition between the San Francisco newspapers.” The fact the giant and influential San Francisco daily journals weren’t included…“affronted all the Bay Area papers,” added Hoeper. After all, Wells-Fargo authorities had tracked Black Bart to San Francisco, found the robbery evidence they needed in San Francisco and had housed him in the city jail. Without tipping local newsmen, as was the norm, the authorities secreted him out of town to Calaveras County. There he was sentenced to six years in San Quentin. 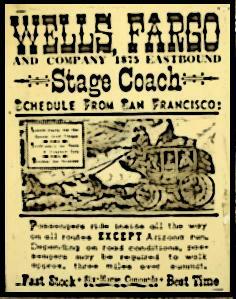 When this information became known it intensified the fury against Wells-Fargo by the local press—especially, according to Hoeper, the San Francisco Examiner. The details of the intricacies of the arrest and subsequent plea bargain would be weeks away. On this evening a young Josiah Ward had happened upon the scoop of his life. He would be the first newsman to actually interview the notorious stage coach robber. Over an eight year span, Black Bart robbed twenty-eight stages. He was portrayed in the nations press as a gentleman bandit who always asked the stage drivers to “Please” throw down the Wells Fargo strongbox and U. S. Mail bags. Unlike other stage robbers of the day, he never robbed any passengers and never shot anyone during his hold-ups. He was gallant to ladies—on one occasion when a woman dropped her purse, he picked it up and handed it back to her. He gained his name when he left a poem in an empty strong box signed “Black Bart PO8.” He would do so on one other occasion. His modus operendi was consistent—he always wore a linen duster, a flour sack mask over his head (with eyes and mouth cut out) and always left the scene of the crime on foot. An experienced woodsman, he was afraid of horses and could walk non-stop for forty to fifty miles. After his capture it was learned he had adopted his moniker, “Black Bart,” from a short story which had run in a Sacramento newspaper. Black Bart’s real name was Charles Boles. He insisted that he be identified, tried and sentenced under the name Charles E. Bolton. He was born and raised on a New York farm—one of ten children. At age 10, his family relocated to a new farm in Indiana. In 1850, aged 20, he and a brother moved to California, lured by tales of gold. His brother died in 1852 and Boles moved to Illinois, took up farming, married and fathered two children. He served with the Illinois 116th Illinois Volunteer Infantry during the Civil War attaining the rank of Lieutenant. He was wounded in action several times during the war. Men who he served with Boles remembered him as “Whistling Charlie.” After the war, disillusioned by farm life, Bolton left his wife and daughters in Illinois to pursue mining in Colorado, Idaho, Montana and Utah.. He eventually moved on to California where in the mid-1870s he took up residence in San Francisco. Frustrated by his mining failures he decided to become a stage coach robber. Boles was apprehended as the result of a hold-up gone wrong. He was shot and winged during his getaway, dropping a bag which contained certain personal items and a bloody handkerchief. The handkerchief and three “soiled cuffs” all bore a laundry mark. Wells Fargo detectives were able to track the laundry mark to a tobacco shop where Boles dropped off his dirty laundry. The shop also had a lounge where “Boles spent a great deal of his time.” The proprietor, Thomas Ware, identified the laundry marked items as belonging to Charles Bolton, a mining engineer. The detective deceived Ware into believing he himself was a mining man and wanted to talk to Bolton about a mining problem. Ware closed his shop and walked the detective to Boles’ boarding house and introduced the two men. In short order, Boles was questioned and then taken to San Andreas where he made a deal with authorities, confessed and was sentenced. He was then transported back to San Francisco jail in route to San Quentin. It was here that Josiah Ward, the young reporter, got the scoop of a lifetime. He spent two hours talking to Boles, watching and listening while “taking notes.” And it would be through the prism of his eyes that the world would become acquainted with the gentleman bandit. Poignantly he wrote about simple and emotional things—a meeting between Bart and his landlady—the two grasping hands while he cried and “she applied a handkerchief to her eyes.” They spoke for fifteen minutes. Another group of friends “stepped forward to talk with the famous Black Bart. All were greeted with a cordiality which showed that Bart was touched by their solicitude,” wrote Ward. Despite the gloomy atmosphere in the room, Ward reported that Bart’s “every other sentence was broken with laughter, incited by quaint manner of expression.” He continued, “From the most solemn iterations of his repentance and regret he plunged into entertaining recitals of incidents of robbery, given with such unction that it was plainly perceptible he is somewhat proud of his achievements.” Continuing, Bart “expressed the shame of my old friends finding me out hurts me more than all.” Being “found out” saddened the proud Bart. He said “I never drink and I don’t smoke. All my friends are gentlemen and I never associated with other than gentlemen.” Then with his humor he exclaimed, “I can’t claim to be perfect. They do say I will rob a stage occasionally. But no one can say that I ever raised my hand to do any harm. I merely carried a gun to intimidate the driver. As for using it—why for all the gold that road ever carried I would not shoot a man.” The police were astounded when he revealed the shotgun he used in the robberies was never loaded. Black Bart, San Francisco Daily Examiner, November 14, 1883. Black Bart, Sacramento Daily Record-Union, November 15, 1883. Black Bart, San Francisco Daily Examiner, November 15, 1883. Black Bart, San Francisco Daily Examiner, November 16, 1883. [Josiah Ward], Black Bart, San Francisco Daily Examiner, November 20, 1883. Handkerchiefs That Have Cut A Figure in Crime, San Francisco Morning Call, February 19, 1899. Frank Parker Stockbridge, “Black Bart, The PO8,” Was the Greatest Of All Bandits Of The “Wild West.” The Chicago Day Book, July 29, 1913. Josiah Ward, 28 Hold Ups With an Empty Gun, New York Tribune, January 8, 1922. Danny Demers, whose Poetry Society go-by is Irish, is a retired business consultant. His wife Chrissy is owner of McT’s Bullpen in Guerneville, California where he hangs out and sometimes bartends. He holds an MBA from Chapman University. His BA in History was awarded by the George Washington University. He served as a staff aide to the late U.S. Senator from Nevada, Howard Cannon, and was elected and served himself in the Nevada Assembly where he was chosen by his peers to serve as Majority Floor Leader. He has also served in numerous capacities in positions with Federal, state and county governments. 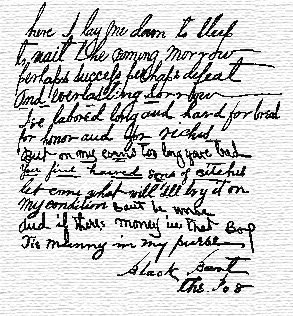 This entry was posted in Poetry, Poetry Society and tagged Black Bart, California, Charles Boles, Charles Bolton, Charles E. Boles, Charles E. Bolton, Daniel J. Demers, George Hoeper, Guerneville, Josiah Ward, McT's Bullpen, outlaw poets, PO8, Poetry, Poetry Blogs, Poetry Lectures, Poetry Lessons, Poetry Society, Poetry Talks, Poets, Russian River, San Francisco, San Francisco Examiner, San Quentin, stage coach robbery, The New Black Bart Poetry Society, Thomas Ware, Wells Fargo. Bookmark the permalink.